If you're reading this, it's too late—well, for cropped trousers, at least. I'm here to report that the perfectly tailored, ankle-baring pant style is fading fast, and it may already be too late. There's a new pant trend in town that's poised to overthrow it and potentially put your tailor out of business. I'm talking about the loose-pant trend that's been quickly gaining steam. The birth of this looser style really came a few seasons ago, though. During the thick of the cropped-pant fog, the Phoebe Philo–era Céline sent trouser looks down its F/W 17 runway with generous fits and longer hemlines that pooled around the models' ankles. 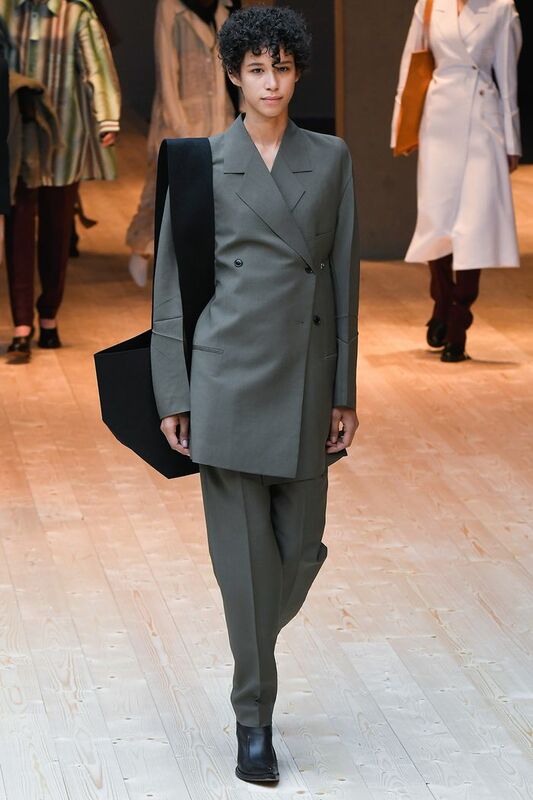 Fast-forward to spring 2019 when a deep nostalgia for all things Old Céline is floating in the general fashion atmosphere, which means this pant silhouette is more relevant now than it was when we first saw it grace the designer's runway. Confused? Admittedly, loose-fitting, baggy pants throw all common knowledge about how pants should fit right out the window. Honestly, if you didn't know this look was a trend, you might assume it was a fashion mistake, that the wearer simply bought ill-fitting pants and skipped out on getting them tailored. But, hey, if fashion insiders are making this "mistake" look so good, then sign me up. Go ahead; ghost your tailor! Try the next size up! Live a little! The only rule for wearing loose pants is that there are no rules. Kind of liberating, right? We've charted the trend's path from the runway to street style to Instagram. Scroll down to see it IRL, and then shop the trousers that nail the look. Neutral but far from boring. The up-and-coming brand offers cool takes on minimal style. These are currently occupying my shopping cart along with the matching blazer. Style these down with sneakers like the model did for a laid-back approach. If you're used to more slim-fitting pants, why not try out a looser pair with a paper-bag waist? It cinches in for some added dimension but still nails the long-and-loose silhouette. Love me a good split hem. Nail the utility trend, too, while you're at it. I tried these on and can happily report that they didn't overwhelm me with added volume. They pool around the ankle but are tapered throughout the leg. Next, 20 Chanel shoes that are somehow under $250.